To discover the API interactively, using Postman is recommended. The Chrome-Extension version of Postman is deprecated and it is recommended to use the native app available instead. This option makes sure, once a HTTP-Header is configured, it will be reused during following requests , if these are initiated by clicking on links resulting from the initial request. This way navigating the structure using the API becomes a snap. 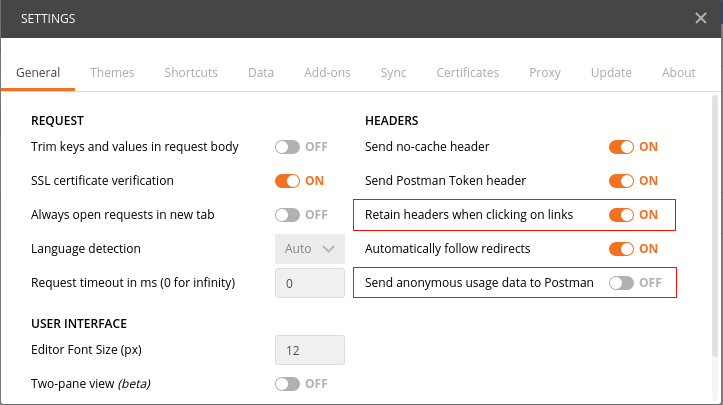 The option Send anonymous usage data to Postman should be deactivated by setting to OFF. Choose the suitable HTTP Verb to be used for your request. This can be selected using the Postman HTTP Verb -> GET drop-down menu. Now set the appropriate HTTP headers. The Accept Header to initiate the right behaviour by the API related to this Request. To set the Authorization Header, there is a reserved tab, that is responsible to generate the final Header based on the authentication method and username + password. After providing these parameters you can create the resulting Authorization Header and insert it into the prepared request by clicking on Preview Request. The request is now ready and can be send by clicking on Send button. The Response of the server is now displayed below the Request. You can easily follow the links on the @id attributes by clicking on them. For every link Postman has prepared another request sharing the same headers that can be send again by licking on the Send button. You can now explore the whole stucture of your application easily via the API using GET requests.